Any redress scheme set up by the Royal Commission is likely to be modelled on the James Hardie national fund set up for asbestosis sufferers. It is likely that the redress scheme will be funded by the perpetrators of child sexual abuse. James Hardie was successfully sued by a number of former employees. Those workers suffered from asbestos-related diseases. At the time of the litigation, James Hardie Industries began stripping assets from its asbestos producing subsidiaries. The company set up the Medical Research and Compensation Foundation (MRCF) in February 2001. The company then transferred those subsidiaries to MRCF. MRCF was then the target for law suits, which freed up James Hardie Industries from legal liability. MRCF was set up with A$293 million dollars in assets. This figure was derived by actuaries who assessed the “best estimate” for its liability at A$286 million for claims for asbestos victims. However, by September 2003 these liabilities were re-estimated at A$1.089 billion. The figure was revised in September 2006 at A$1.55 billion. During the 2004 Jackson inquiry into James Hardie’s dealings over its asbestos liabilities the company submitted that it would be prepared to provide further funding if a statutory compensation scheme was set up, limiting legal rights of claimants and capping the compensation payouts. This proposal was rejected by state and territories governments. MRCF went into liquidation in 2004 after announcing in 2003 that it did not have sufficient funds to continue paying compensation. James Hardie Industries declined to provide further funds to MRCF. Governments, unions and the public mounted international pressure on James Hardie. The Asbestos Injuries Compensation Fund (AICF) was set up in 2006 under an agreement with New South Wales government. Under the agreement two trusts were established: the Charitable Fund and the Discretionary Fund. AICF is the trustee of the two trust funds. James Hardie Industries provides the funding for the AICF to pay compensation to victims. Funding has been approved by James Hardie shareholders of up to A$1.55 billion. The Australian Taxation Office agreed to allow payments by James Hardie to AICF to be tax- deductable. So far, James Hardie Industries has contributed about A$550 million to AICF and according to its March 2012 annual report there were 456 claims against the subsidiaries for the 2011/12 financial year and 494 in the 2010/ 11 financial year. According to an actuarial report in 2007, it is expected that the total number of claims, past and future, will be 12,513. 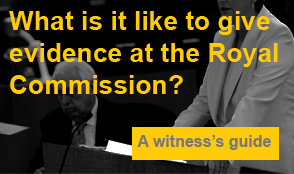 All eyes will be on the Royal Commission to see how it makes its recommendations relating to redress for victims from the Institutions concerned. Perhaps the James Hardie experience will become a model for a statutory entity that will be given a responsibility to set up a national fund for victims of institutional child sexual abuse. I will continue to keep you posted.